Larceny simply means theft. Grand Larceny is felony theft of property of great value. Petit (petty) larceny is misdemeanor theft of property of lesser value. Gulfport defense lawyer Rufus Alldredge defends larceny and theft charges in all Mississippi state and federal courts. Prove the value of the stolen property. Felony grand larceny is punished according to the value of the property in question. Greater value translates to greater punishment. The burden to prove valuation rests squarely on the prosecution. The defense lawyer is entitled to dispute that value. However, the law requires combining the value of all property taken from single victim. A third charge of misdemeanor petit (petty) larceny in five years can be enhanced to a felony. Mississippi also has a special enhancement or increased punishment for larceny from a church or synagogue. 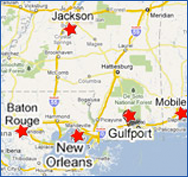 Larceny in Mississippi is usually prosecuted in state court. However, federal investigators and courts have jurisdiction (legal authority) over certain types of theft. The Mississippi Coast has a navy base, air force base, veterans administration hospital, national parks, national forests, and Stennis Space Center. Theft from federal installations is usually prosecuted in federal court. Mississippi has a special law concerning theft of motor vehicles. It is no longer necessary for the prosecution to prove the defendant intended to permanently keep the vehicle. Trespass less than larceny and joyriding are no longer defenses. Taking a vehicle without permission can be charged as a felony or misdemeanor depending on the value of the vehicle. A person who aids and abets (helps) another person to steal a vehicle can also be found guilty. Mississippi’s motor vehicle theft law provides for restitution for damages and an enhanced penalty for a second offense. Mississippi has a specific law regarding theft of timber. Stealing timber from the land of another can be charged as a misdemeanor or felony depending on the value of the timber. In addition to criminal penalties, the court is authorized to order restitution for the value of the timber, lost income, and attorney fees. A strong defense will question legal ownership of the timber, and whether the defendant made a good faith mistake as to ownership, boundaries, and deed requirements. In some cases it may be necessary to do a title search and obtain a survey to prove ownership. Larceny of rental property means obtaining possession of equipment with intent to defraud. Theft of rental property includes fraudulent leasing of equipment as well as abandoning or failing to return rental equipment. Rental larceny can be a misdemeanor or felony depending on the value of the property involved. Defenses can include mistake, modification of contract, impossibility of performance, and no intent to defraud. Larceny under rental agreement means exercising unauthorized control over the property. This includes abandoning, concealing, disposing, selling, or not returning the rental property. The rental larceny law has notice and demand provisions similar to civil cases. However, larceny under rental agreement can be charged as a misdemeanor or felony depending on the value of the property. Stealing from coin operated machines includes vending machines, laundromats, parking meters, change machines, and any type of machine that accepts coins. In addition to breaking, opening, or destroying a coin operated machine, it is also a crime to possess or use any device that facilitates the crime. Larceny of coin operated machines is a misdemeanor. However, other charges such as malicious mischief (vandalism) may also be filed. The Mississippi Gulf Coast has bountiful natural resources. Fishing is our heritage. The Mississippi Sound has ample space and opportunity for commercial and recreational crabbing. Mississippi law has strict protections for commercial and recreational crab traps. Although theft from crab pots is a misdemeanor, the fines increase sharply for second and third offense convictions, with fines ranging to thousands of dollars. In Mississippi, it is a felony to steal any dog. Regardless of breed, value, or any other consideration, a person convicted of theft of a dog faces a felony conviction and prison. Unfortunately, cats, birds, horses, and other pets do not enjoy the same legal protections as dogs. Theft of livestock is punished as a felony or misdemeanor depending on the value of the animals taken. Fraudulent conduct in acquiring the livestock is a felony, including failure to promptly forward payment. In addition, the rightful owner can be awarded lost profits and attorney fees. Larceny of credit cards by trick, embezzlement, or false pretense is a misdemeanor. This law applies to credit cards only. Fraudulent use of a credit card is either a misdemeanor or felony depending on value. This law is in addition to Mississippi’s credit card fraud law. The Mississippi Supreme Court has held that larceny is not a crime of dishonesty or crimen falsi. Every case is different. Defenses are fact specific. The best Mississippi defense lawyers know how to raise defenses specific to your case. If you are being investigated or have been arrested for theft or larceny, call the law office of Rufus Alldredge today at 228.863.0123. We are located at 1921 22nd Avenue in Gulfport, Mississippi.